Why you need this sound bar? Because built in advanced 4.2 Bluetooth & DSP technology, MAGACRA S11-Pro Bluetooth sound bar will bring a visual and aural feast. That is why we provide this device for you. 1.Advanced 4.2 Bluetooth technology: the use your smart-phone or other device connected by Bluetooth to play music you love. 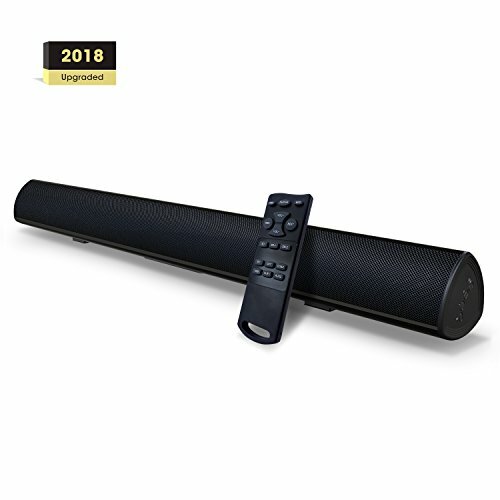 2.Multiple options for connection: Sound bar supports Optical/RCA/Aux, Bluetooth (for most new TV, cellphone and other device). No matter what devices you use, enjoys unparalleled access with multiple connection methods available. Easily enjoy high-quality stereo experience of the home theater. 3.Choose your music by remote: You can use remote to operate music playback,device settings, and more whatever you're watching. 4. Sound Bars fit with any space and are sized to match your TV, you can place the unit everywhere and bring you immersive, emotionally enriching experience. 1 x Stereo RCA to 3.5mm Audio Cable. Upgraded Version: High-sensitivity remote control displays the different modes by means of different colored LED lights. Deep bass, improved power. Advanced built-in Subwoofer bring powerful bass for all your movies, music and TV shows. Enjoy expansive audio and crystal-clear sound(Fit for 32Inch--50Inch Smart TV). Loud Soundbar for TV: 2 X Improved Full Range drivers, 2 X Precision acoustic tweeter drivers, 2 X bass reflex tubes bring powerful bass. employed anti-noise technology to produce smooth, clean and wide music. 105 dB of room filling, less than 1% total harmonic distortion. Advanced 4.2 Bluetooth Technology: Pair by Bluetooth in seconds to your any Bluetooth devices. The wireless connection range is 33 feet, so you can listen to your device even when it's far away. Or connect via line in, RCA, Coaxial in, USB, or optical with the included cables. 3D Surround Sound System: Support 3D/SR-1/SR-2 modes thanks to DSP Technology. Bring you a fantastic surrounded sound. Lets you hear every details of your music and movies, with crisp, breathtaking detail and exceptional clarity. Ensure that your viewing experience sounds as good as it looks. Worry-free 90-days trial: 90-days home trial and friendly customer service for this sound bar. Please send us an email for a response within 1 working day. (support@bylfirm.com) or visit our official Facebook:BYL and PM us directly. Have great day! If you have any questions about this product by BYL, contact us by completing and submitting the form below. If you are looking for a specif part number, please include it with your message.